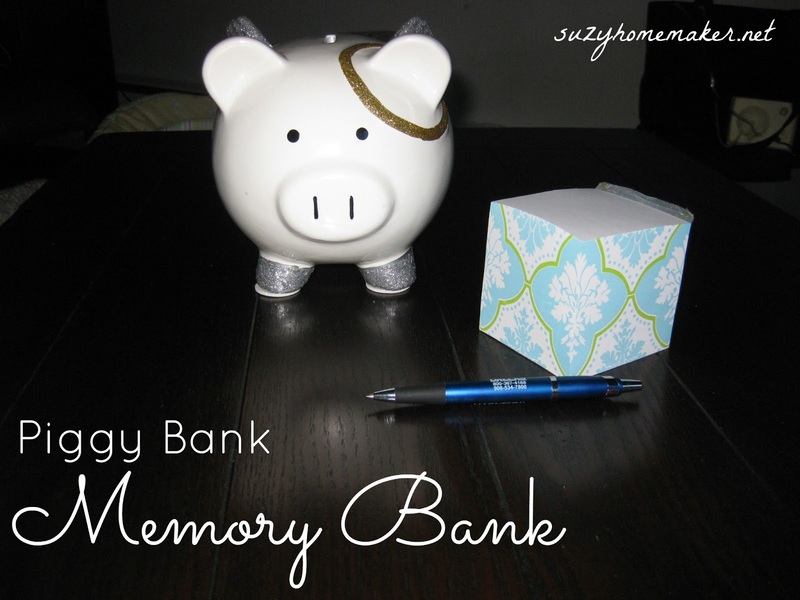 This is a great tradition to start in the beginning of the New Year - a memory bank piggy bank. Bank memories not money. So far we have four piggy banks in our house. I really like piggies. The small silver one was the first one I got while dating #1. The large pink one was the second one I got from #1. He brought it back from a trip. The flowered one is actually my baby's from my sister for Christmas. Finally the white angel piggy is from my SIL and family also for Christmas. The pink piggy is nice and large and can hold a ton of change. So I designated that as the loose change piggy. I realized that I didn't really need another loose change piggy, because it would take quite a long time to fill up pinky. I needed Angel piggy to have a purpose. I decided to have Angel piggy be a memory piggy. Throughout the year #1 and I will write down memories on small pieces of paper and put them in Angel piggy. Then on New Year's eve we will open the piggy and read all the memories we recorded over the year. Almost like a journal. It will be a great new tradition and much easier than remembering to do a baby book or write in a journal each day.